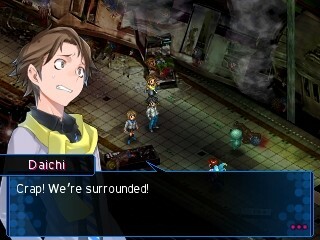 Shin Megami Tensei: Devil Survivor 2 Record Breaker — sure, we’ve talked about how the game comes with two stories to fight, the original Septentriones arc and the brand new Triangulum arc. And we’ve talked about the fate system that helps you build links between party members so they can help you more in battle. We’ve even talked about the intricacies of fusing demons. But now for the FUN stuff: COMBAT. In this brand new trailer, you get the real feel for the game – be it selecting skills to crack by poaching specific demons, setting your party members and skills so they can decimate the opposition, or exploiting elemental weaknesses and abusing the Extra Turn system to wipe out enemies (and get monetarily rewarded for doing so in style)! With new abilities and demons, a brand new character, fully voiced English story dialogue, and over 100 hours of gameplay, the new content in Record Breaker greatly expands on the original DS game. Most importantly, Record Breaker will introduce a brand new chapter to the captivating story. Both newcomers and veterans alike will have a chance to learn more about the world of Devil Survivor 2, with the option of skipping to the new content right away or playing through the original game first. Either way, hard decisions will have to be made in order to survive. Coming May 5, 2015 to the Americas on Nintendo 3DS.